A zebra longwing butterfly fluttering among the passionvines. All this month I've been seeing large numbers of zebra longwing butterflies gathering around the seagrape tree in our front yard. I became curious, and this weekend decided to investigate. Mystery solved: a native passionvine had crept up the seagrape trunk and into the leaves over my head. Passionvines are the larval food plant for a group of butterflies called longwings, of which the zebra is one, and this particular passionvine had been stripped bare of most of its leaves. I settled myself and looked for details among the brown and green vines hanging from the branches. I soon spotted a spent chrysalis, then another, and another. 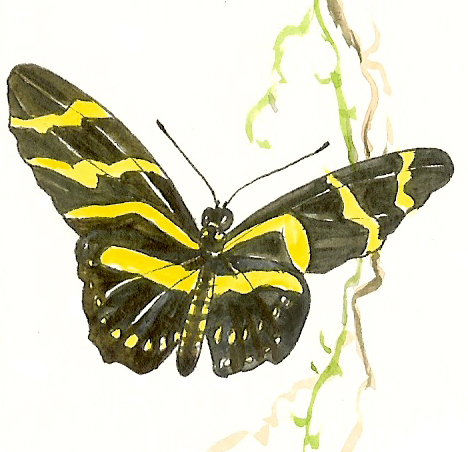 A zebra longwing's chrysalis is dull brown with darker brown markings, resembling a dried-up leaf. I cut one down from above my head in order to take a closer look, and it started a vigorous swinging motion in my hand. I nearly dropped it! This chrysalis was still occupied, with its inhabitant attempting to scare me away so I wouldn't eat it. Doesn't this chrysalis resemble a dried leaf? Or an alien life form? The chrysalis body is about one inch long, with feathery-looking "tails" and four iridescent metallic spots on the concave portion. I'm guessing that I've been seeing the butterflies as they emerge from their chrysalis, and then perhaps when they return to lay eggs on the passionvine. Zebra longwings have "zebra stripes" in a distinctive yellow and black pattern, making them easy to identify. It is the official Florida State butterfly. Zebras fly in slow, lazy, swooping paths. They roost in small communities at night, hanging down from a tree branch or similar perch. It's larval food (passionvine) makes both the caterpillar and the butterfly taste bad to predators. They live longer than many of our other butterflies - sometimes up to six months. Caterpillars feed exclusively on members of the passionvine family. Zebra butterflies feast on nectar and pollen. Protein in the pollen contributes to their long life span. They are brush-footed butterflies, which means that their two front legs look like small brushes. This is how they taste plants. They can be found throughout Florida (especially south Florida), and range into Texas, Mexico, and Central and South America. The caterpillars are ferocious-looking: a white body with black spines all over, and orange-brown feet. The spines are harmless. The newly laid eggs are tiny yellow oval-shaped spheres, usually found on the tender tips of young passionvine leaves and tendrils. Zebra longwings are one of my favorite butterflies. In the wild, they are a resident of hammock areas, but are equally at home in parks and home gardens. All they need are the basics - a food source (for both caterpillar and butterfly), water, and shelter. with a Pitt Artist pen in black, XS size, with Daniel Smith watercolors. Beautiful paintings and some interesting information. I did not know they were Florida's state butterfly. I picked up a flyer explaining how to plant a butterfly garden at a local nursery last week. I have some plants in our front yard that I think are butterfly attractors, and maybe if I add some more, I'll get more of these lovely visitors. 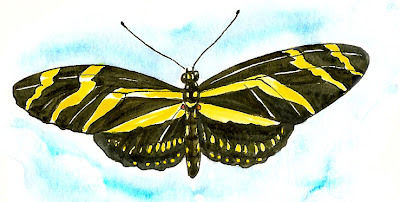 I saw a few zebras last winter, my first longwings. Beautiful! And I believe I could find the chrysalis just from your painting. My silkworms have all but one made their cocoons, and the ones I tricked into making flat pads have turned into pupae out in the open. It was fascinating to watch the process that normally happens hidden away inside the cocoon. Cheers, and thanks for the zebra! Hi Kathy, and thank you so much! You'll enjoy having a butterfly garden, especially when you see all of the different butterflies that will come to visit. I can tell you that having larval food plants are a great magnet for the adult butterflies. Passionvine (almost any of them) attract zebras, Julias, and Gulf Fritillaries. Pipevine brings in the swallowtails. Good nectar natives for Florida are firebush (all butterflies like this one)and the cassias. 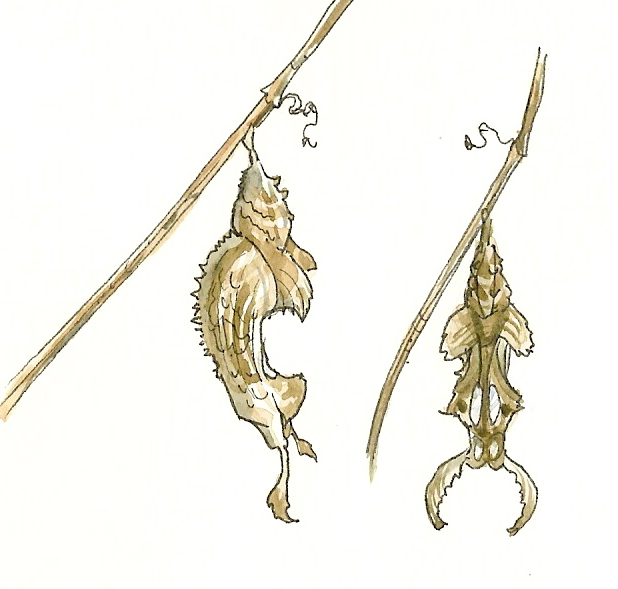 Sulphurs use cassias as a larval food as well. Verbena probably grows well up in your area, and is a pretty plant and good attractor. It always surprises me that just a few of the right plants attract quite a few butterflies. Have fun!! I wish you well on your trip to Japan - I'm envious! Have and interesting (but fun)adventure!